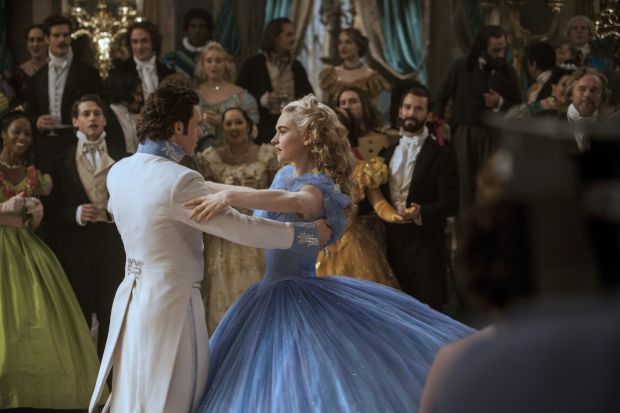 NEW YORK (CNS) — “Cinderella” (Disney) injects vibrant new life into a venerable fairy tale. The result is an exuberant live-action retelling of the oft-filmed fable, the most famous screen version of which is Disney’s classic 1950 animated feature. There’s a lot of death in the Cinderella story, but here that aspect of the tale is treated gently. Ella (Lily James) tends to her dying mother (Hayley Atwell), whose final request to her is, “Always have courage and be kind.” This becomes Ella’s life motto — and not a bad one at that. Her sunny nature and good will inspire all creatures, great (fellow humans) and small (white mice). Preceding “Cinderella” is a short animated film, “Frozen Fever,” featuring characters from the blockbuster 2013 movie “Frozen.” It’s Princess Anna’s (voice of Kristen Bell) birthday, and her sister, Queen Elsa (voice of Idina Menzel), is planning a party — despite feeling unwell. Given Elsa’s frost-producing proclivities, as highlighted in the original, however, her sneezes bring predictably chilly consequences. The Catholic News Service classification is A-I — general patronage. The Motion Picture Association of America rating is PG — parental guidance suggested. Some material may not be suitable for children.